3.5mm is commonly found on headphone jacks on cell phones, computers or MP3 players. Stereo is commonly found on most stereo products and are easily identified as the Red White Jacks on Stereos and other audio products. Many new homes already contain structured cabling systems of inexpensive cat 5 twisted pair cable. Now you can take advantage of this existing wiring by adding these stereo audio balun to each end, and transmits analog audio over inexpensive twisted pair wiring up to 240 ft, rather than rewiring your home in order to send these signals from room to room. And, they are designed to work in pairs, and provides a low-cost, versatile cabling solution for stereo audio distribution by utilizing a building's existing structured cabling system. 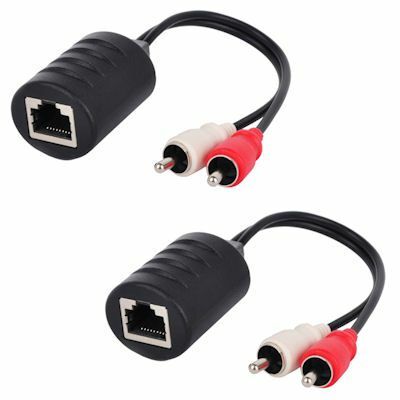 Easily Convert your stereo audio signal for connection to UTP network cable with these handy baluns. Ideal for making long audio run with pre-made patch lead or for feeding audio signals through existing point to point UTP cables in buildings. Capable of carrying audio signals up to 240ft, the balun fly lead connects directly from the input or output socket of your audio system to the RJ45 termination of a UTP cable. 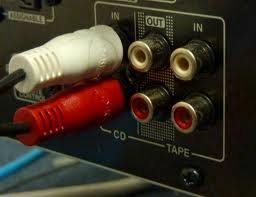 These audio extender's are used and sold in pair. Each package consists of both ends that the cat 5 or cat 6 cable plugs into. These are perfect and provide a low cost-effective solution for extending audio signal for long distance. Great for installers but easy enough for any home owner. Installation - It is simple. Just plug in the cable to each adapter. Plug them into your devices and then - That's it your done.